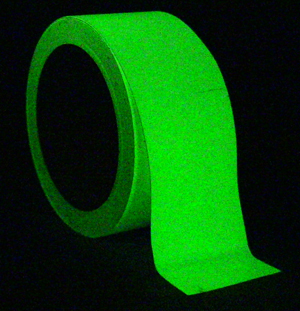 These tapes are not anti-slip floor tapes but are for use as glow-in-dark (photoluminescent) egress markers on walls, baseboards and thousands of other objects. These glow for about 20 minutes – long enough to evacuate a small building. Heskins' egress tapes stick to nearly any surface yet can be removed cleanly. 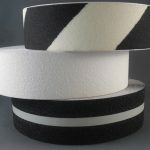 These tapes are not anti-slip floor tapes but are for use as glow-in-dark egress marker tapes on walls, baseboards and thousands of other objects. These glow for about 20 minutes – long enough to evacuate a small building. Our egress tapes stick to nearly any surface yet can be removed cleanly. They are not the longest lasting tapes we have, but are very affordable.